I got a awesome product to tell you about and it is a product that will be great for Thanksgiving. Bee Sili SUPER Silicone BBQ Grill Oven Gloves are these cool gloves that are made from silicone and will allow you to pick up your Thanksgiving turkey straight from the oven and place onto a serving platter. I don't know about you, but I always struggle trying to get my hot turkey out of the pan when it is hot. I usually use those big forks which always results in my turkey looking ugly. Well with these Super Silicone gloves I can lift my turkey out of the pan and my hands don't get burned. 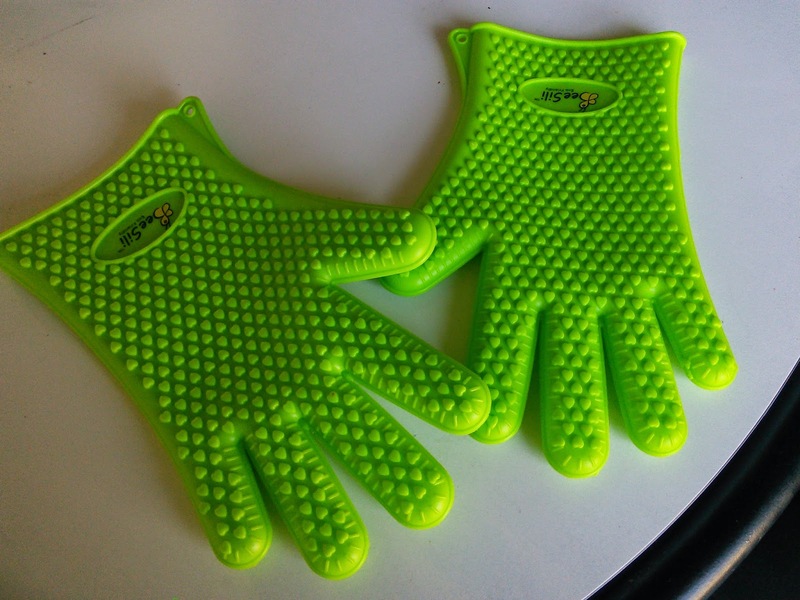 Bee Sili gloves are made from FDA approved silicone and come in 4 cool looking colors. They are great for many uses for hot and cold. *You can remove items from the oven and I love that they cover over your wrists too so no getting burned there either. *They are great for BBQ foods and also camping. *When your kids roast marshmallows, they can wear these gloves and be safe. *They are great for grabbing cold drinks from an ice chest. *I wear these when I need to get food out of my deep freezer. *Tend the fireplace and no getting burned. *Open lids with ease. *The list goes on as these silicone gloves have many uses. I love that they are dishwasher safe for bacteria free cleaning. They are heat resistant up to 425 degrees F. One size fits most hands. They also come with a free basting brush, another Thanksgiving must. I made a whole chicken in my oven to show how I can pick it up and not burn my hands. I would have made a turkey but they are not on sale yet. Watch the below video to see the Bee Sili SUPER Silicone BBQ Grill Oven Gloves in action. To order a pair of these awesome Bee Sili SUPER Silicone BBQ Grill Oven Gloves that will be great for that Thanksgiving turkey and more, click on the below link. Awesome!! Every guy should have some of these! Oh my goodness! I need these in my life! Ahhh! I've never seen gloves like that before. These look great. These would come in handy since I'm such a chicken when it comes to flipping the burgers over the grill. I love silicone kitchen/cooking products. They are so durable. My husband needs some of these! These would be perfect for grilling as well! I'm going to have get a pair for a stocking stuffer! I have never heard of these gloves before. I will have to look for them this would be a great present for hubby. I love the idea of opening jars with them! How handy! Green is my favorite color, and I wouldn't mind haven't a pair of these. Nothing worse than burning your hands when cooking. Not a pretty look. These look awesome. I think they would never the perfect gift for dad. These items look so handy for the kitchen :) They would be great for all of the cooking this holiday season! I love these and I could use some new oven mitts! I really could use on of these this time of year. I'm forever baking something & you wouldn't believe the amount of times I burn my hands.